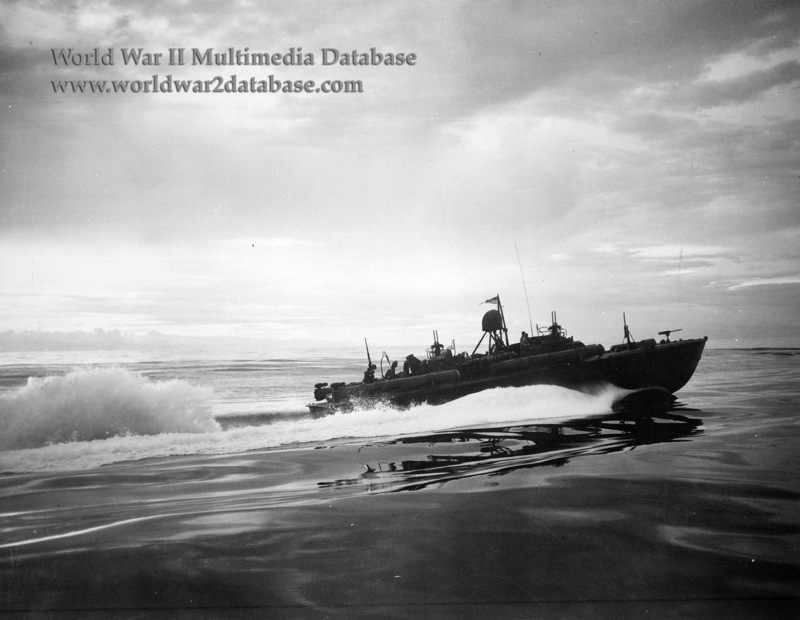 Patrol Torpedo Boat of the PT-103 class at speed. These 80-foot (24.4-meter) boats, manufactured by Electric Launch Corporation (ELCO), were the most numerous of the three major designs. This boat has two dual-mounted hydraulically-operated M2 .50-caliber Browning machine guns, plus two more hand-operated Brownings in single mountings forward. An additional 20mm Oerlikon antiaircraft gun is mounted on the stern. Four launchers for 21-inch (53.3-centimeter) Mark VIII torpedoes were standard. These torpedoes carried a warhead of 466 pounds (211 kilograms) of TNT. Fired by gunpowder and packed with grease to insure smooth ejection, the tubes would ignite the oil, causing a tremendous flash. At night, this would reveal the boat's presence to their enemy. American boats would quietly maneuver within 1,000 yards (914 meters) before attacking to ensure a hit, because the American torpedo was so unreliable. The Japanese "Long Lance" type 93 24-inch (60.1-centimeter) destroyer torpedo was accurate to 40,000 yards and had a much heavier warhead of 1,083 pounds (490 kilograms). Later torpedo boats were issued the Mark XIII torpedo in a roll-off rack that made maintenance and firing simpler. 296 80-foot ELCO boats were in service during the war. Most of the survivors that did not go to Lend-Lease were burned off Samar, Philippines in late 1945.